I have chosen to do a poster for THE ROCKWERCHTER FESTIVAL 2013 and I start brainstorming for new conceptual Poster. 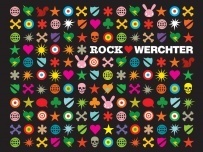 Rock Werchter 2013 will take place in Werchter (Belgium) from Thursday 4 July until Sunday 7 July. For four days the festival grounds will enable you to see and hear the best on offer on three stages. Well-established names, heroes from past and present and the majors get – as usual – their spot on the Main Stage. The Marquee focuses on electronic music in all its danceable forms on Thursday and Friday. On Saturday and Sunday its line-up will be completed with up-and-coming talent, (more) intimate concerts and dance beats in the early hours. In The Barn we welcome back familiar names, but it is also thé spot to discover tomorrow’s heroes. The better concert hall on a festival. Rock Werchter is a firm believer of programming across genres, which people like. During the four festival days in 2012 somewhat 140,000 (unique) festival-goers from all over the world found their way to the festival that was sold out in advance. The festival is an international hit and has already been awarded multiple prizes.